The Chemical Corps branch is focused primarily on warfighting operations and training in support of nuclear, biological and chemical defense, smoke, flame employment, support of weapons of mass destruction, force and domestic protection programs. The Chemical Corps provides the Army with a highly trained corps of chemical experts to advise commanders and staffs at all levels in the Department of Defense and lead chemical units. The Chemical Warfare Service was established on June 28, 1918, combining activities that until then had been dispersed among five separate agencies of Government. It was made a permanent branch of the Regular Army by the National Defense Act of 1920. In 1945, it was redesignated the Chemical Corps. The Chemical Corps has served the nation proudly in war and peace. From the deadly trenches of Word War I to the hot sands of Arabia in 1991, the Corps has kept the Army ready to survive and fight in a nuclear, biological, and chemical environment. Modern chemical warfare was born in the trenches of Word War I on April 22, 1915. the Germans commenced a fierce bombardment of the French lines near the Belgian city of Ypres. As the shells stopped falling, a blue-white mist began to rise from the German trenches. It gathered into a cloud that turned yellow-green and slowly drifted over the French lines. the Germans had released deadly chlorine gas from cylinders near their trenches. two French divisions collapsed. This new form of warfare created a gap of over four miles in the French lines. The United States was two years from involvement in the war, but when that time arrived chemical warfare had become much more sophisticated. Livens projectors, artillery, and mortars were now delivering the deadly gases. Also the gases had become much more fearsome as the introduction of phosgene, hydrogen cyanide, and mustard agents had occurred. General "Black Jack" Pershing led his American Expeditionary Force into this deadly environment in 1917. He knew the lives of thousands of young soldiers would be forfeited if he could not find a way for them to use gases offensively and to protect themselves against use by the Germans. The same order which organized Pershing's headquarters also created the position of the Chief of the Gas Services, and appointed its first occupant Major General Amos A. Fries. The War Department, during this time, authorized a gas and flame regiment for each American Army. In August 1917 the First Gas Regiment - the famed "Hellfire Boys" - of the American expeditionary force was organized. Massive efforts aimed at research and development were completed so that by the end of 1918 President Wilson ordered the establishment of the Chemical Warfare service as a branch of the Army. Major General William L. Sibert served as the chief of the CWS and guided the Army safely throughout the rest of the war and peace that followed. During the early 1920s the Army came very close to eliminating the CWS, but realized that having a chemical capability was useful. The concern of chemical warfare was so great that in 1920 Congress made the Chemical Warfare Service a permanent branch of the Army to ensure centralized control of chemical warfare efforts was retained. During the inter-war years, although on a very lean budget, the CWS continued to experiment in offensive and defensive chemical operations. During World War II the Germans, Italians, and Japanese were fully capable of using chemical agents effectively in war. The Germans had developed nerve agents exponentially more deadly than the agents released in WWI. The Italians used mustard gas to defeat the Ethiopian armies in Africa. The Japanese used the full scale capability against the Chinese. Also the new threat of biological warfare had emerged. 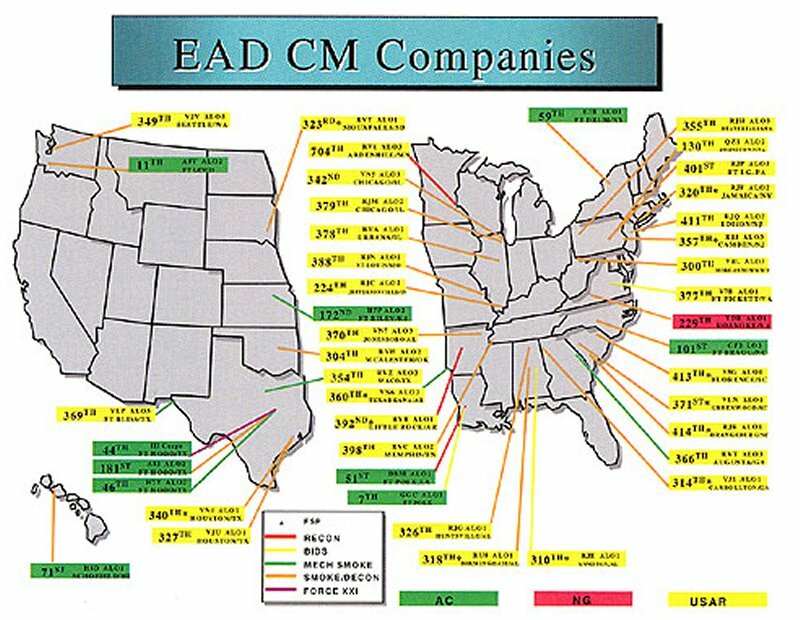 The efforts of the Chemical Warfare Service deployed chemical munition stocks and the means to disseminate these stocks throughout the world as US forces moved against the enemy. The Service prepared the force during mobilization in the protection techniques which helped prevent any enemies from using chemical agents. Chemical soldiers did not just wait around on the battlefield. Chemical 4.2 mortar sections delivered smoke and high explosive fire in close support of maneuvering infantry and armor units. Chemical soldiers manned smoke generators on land and at sea in air defense and other close support roles. The chemical Warfare Service also developed flame weapons which included flame tanks as well as the more recognized portable flame throwers. The weapons were often decisive in overcoming enemy strongholds in the Pacific. The Army Air Force delivered Chemical Warfare Service incendiaries over targets in Japan with some raids having destructive effects comparable to that of the atomic bomb used of Hiroshima. The Chemical Warfare Service was redesignated in 1946 as the Chemical Corps. It focused its efforts on improving chemical and biological offensive and defensive capabilities and refinement of its smoke and flame programs. The new mission of defending against nuclear warfare was included at this time. The US involvement in Korea required response by chemical soldiers. The 4.2 inch chemical mortar sections again delivered effective smoke and high explosive munitions in support of combat power. Smoke and flame operations were again crucial. and, once more, the NBC readiness of our force deterred the enemy from chemical warfare use. The Chemical Corps faced the new challenges brought with the American involvement in Vietnam gallantly. The Corps developed and used "people sniffers" to find the enemy in their jungle hideouts. "Tunnel rats" used tear gas and sheer bravery to clear the enemy from his caves. Chemical Corps personnel used thickened flame fuel devices to clear jungle areas of mines and booby traps and to prepare helicopter landing sites. Herbicides rendered vast areas of jungle useless as cover for the enemy. Although U. S. forces were not deployed in support of the Arab-Israeli War, its effect on the Chemical Corps was profound. A move to abolish the Chemical Corps in 1973 was approved and was being processed as part of the post conflict services drawdown. The increased Soviet capabilities to wage chemical warfare were reveled during this conflict. Soviet doctrine called for routine use of chemical weapons on the battlefield. In 1976 , Congress reversed its decision and implemented a plan to revitalize the Corps which had been reduced to just 200 soldiers. Operation Desert Storm raised the specter of chemical warfare once again. Since the early 1980s the Chemical Corps, dramatically revitalized and increased in size, again rose to the occasion. The Army was again ready for the threat, and because it was ready, the enemy saw no advantage in using it. Smoke operations were effectively used in both deception and screening operations. The Chemical Branch is a branch of diversity, opportunity, and challenge. Chemical officers provide expertise in all aspects of nuclear, biological, and chemical defense and operations to commanders and staffs at all levels. The chemical officer can expect to perform in diverse duties such as platoon leader, commander, operations officer, project manager, instructor, and engineer. The chemical officer must attain expertise in operations, training, intelligence, logistics, personnel, management, research and analysis. The role of the chemical officer is challenging, but provides excellent opportunities for motivated officers. 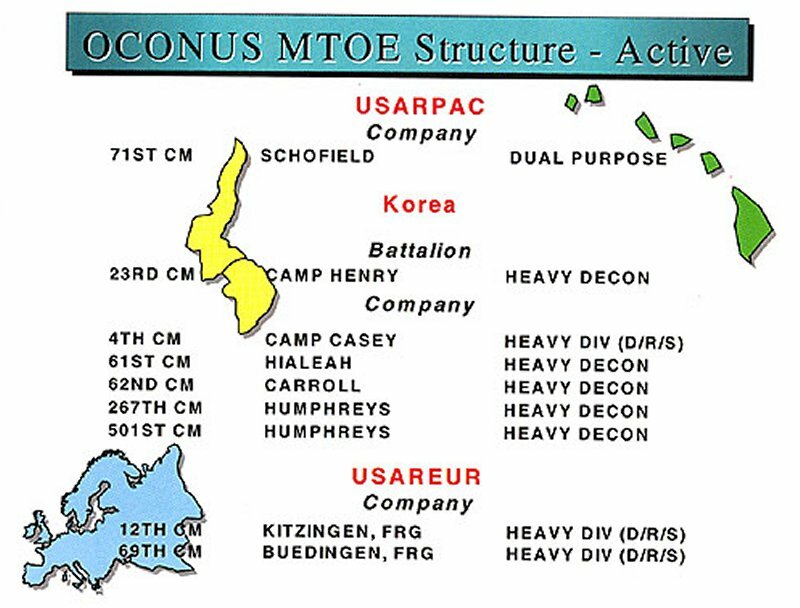 Chemical Company (Heavy Division) Contains a headquarters' platoon, a smoke platoon, a recon platoon and four decon platoons. 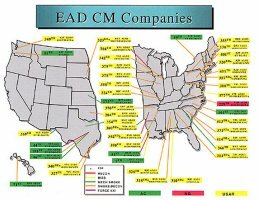 Organic to this company is its' own maintenance section within the HQs PLT. The smoke platoon utilizes the M1059 Smoke Generator System or the M3A4 Smoke Generator mounted on HMMWVs. Each of the Decon platoons have three M12A1 Decon Apparatus' mounted on a five ton truck. The recon platoon uses the FOX NBC Reconnaissance Vehicle to conduct area reconnaissance. 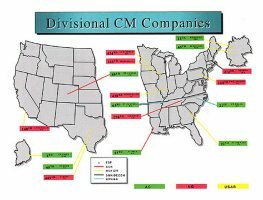 Chemical Company (Light Division) Contains a headquarters' platoon and four dual purpose smoke & decontamination platoons. Again organic to the company is its' own maintenance section. The dual purpose platoons utilize the M17 SANATOR and the M3A4 smoke generators and the M12A1 decon apparatus'. The smoke generators are mounted on HMMWVs while the decon apparatus' are mounted on 5-ton trucks. 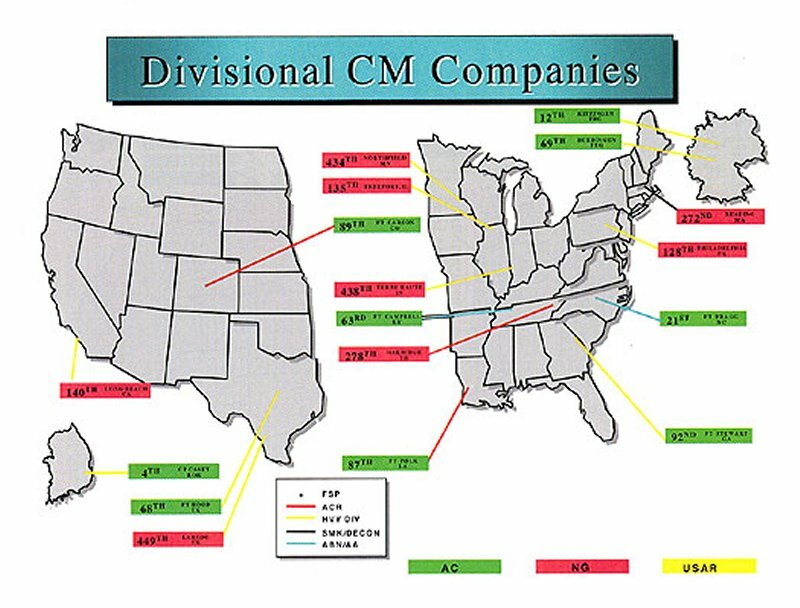 Chemical Company (Armored Cav Regiment) Contains a headquarters' platoon, a recon platoon and a decon platoon. The equipment is the same type as that which the heavy company uses. Platoon Leader, Decontamination Platoon Responsible for providing NBC decontamination (DECON) and reconnaissance (RECON) support to a brigade-sized unit. The platoon may operate equipment DECON stations, conduct RECON operations to locate and report areas of NBC contamination. When the establishment of a DECON site is required, the platoon leader will receive elements from many different branches which they must task organize into an effective operation. Some examples of different elements include: infantry for perimeter defense; air defense; military police for traffic control; ordnance for maintenance; quartermaster for clothing and equipment exchange; engineer for site preparation; medical; and transportation. This is no easy task and requires a high degree of leadership, tactical and technical expertise. Platoon Leader, Smoke Generator Platoon Responsible for providing large area smoke support, normally to a battalion-sized unit. The smoke platoon serves as a combat multiplier by reducing the vulnerability of maneuver battalions thorough the use of smoke screens. Smoke units are located throughout the battlefield from support facilities in the rear to the covering force areas. Typical smoke missions include screening maneuver units, concealing support facilities, concealing breaching operations, conducting deception operations, and screening likely avenues of approach for threat helicopters forcing them to fly higher, thus rendering them more vulnerable to friendly air defense systems. The smoke platoon uses its generators either in a mechanized, motorized, or ground-emplaced mode. The smoke platoon has the additional mission of supporting units in the perimeter defense and barrier plan through the use of flame fuel expedients. Platoon Leader, NBC Reconnaissance Platoon Responsible for providing NBC reconnaissance (RECON) support to division and corps units. In the division, the RECON platoon is assigned to the Chemical Company, but attached to the Armored Cavalry Squadron. 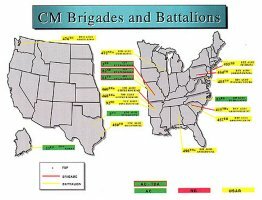 In the corps, the platoon is assigned to the Armored Cavalry Regiment. 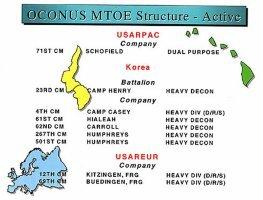 In either case, the platoon's mission is to locate, mark, and report areas of NBC contamination enabling the maneuver forces to avoid these areas. By accomplishing these RCON missions, the platoon can save the maneuver units many casualties and many hours of decontamination operations. Battalion Chemical Officer Responsible for personally advising the battalion commander on all aspects of NBC warfare and for insuring the battalion is sufficiently trained to fight and win on the integrated battlefield. Not as glamorous as a platoon leader, it is one of the most demanding jobs for a second lieutenant. Few other lieutenants enjoy the equal status of the more senior officers on the battalion staff and personally advise the battalion commander. The battalion chemical officer must be aggressive, imaginative, a self- starter, and be able to "stand alone" as the resident expert in all aspects of NBC warfare. He also develops experience in all aspects of combined arms operations by working very closely with the battalion S-3. This affords the battalion chemical officer the opportunity to develop tactical and technical expertise in combined arms operations at a very early stage in his career. The battalion chemical officer can easily be described as the backbone of the Chemical Corps.